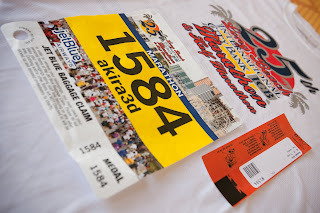 Why is it that even when you pre-register long before race day (in this particular case, I rolled over my registration from last year's), you still have to attend some Health and Fitness Expo to pick up your bib, timing chip, and goody bag? This would not be nearly as annoying if the race organizers did not make their website intentionally vague as to where the *cheap* ($4?!?!?) parking was located. By the time I learned that the lot would cost $10, I was already in a row of cars with nowhere to pull out. Ugh! And while this marathon is the second closest held to my home, the total drive is still longer than an hour!